Hosei University Research Center for International Japanese Studies | Report of Visit to and a Workshop at HIJAS by Professor Xinsheng Wang. 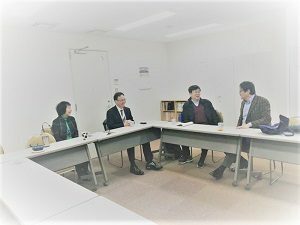 Hosei University Research Center for International Japanese Studies HOME > News > Fiscal Year 2018 > Report of Visit to and a Workshop at HIJAS by Professor Xinsheng Wang. Report of Visit to and a Workshop at HIJAS by Professor Xinsheng Wang. Professor Dr. Xinsheng Wang of Peking University came to HIJAS and had a meeting with Professor Dr. Min Wang of the HIJAS on Thursday, 17th January 2019. After this meeting Professor Dr. Wang held a workshop on academic exchange between Japan and China. Professor Dr. Hongwei Zhao, Professor Dr. Xinsheng Wang, Professor Dr. Ruixue Li, and Professor Dr. Min Wang (right to left).